Look How Many Zeroes in Deficit Now! As the Obama administration prepares to finance a 2010 budget deficit expected to top $1.5 trillion, the American public is largely unaware that the true negative net worth of the federal government reached $70.7 trillion last year. That's more than $70,000,000,000,000. The figure is five times last year's U.S. GDP and exceeds the world GDP by about $10 trillion. "The future of this course is hyperinflation," said John Williams, editor of the electronic newsletter Shadow Government Statistics. "We are headed to a point where the magnitude of U.S. federal budget deficits will undermine investor confidence in the U.S. Treasury." 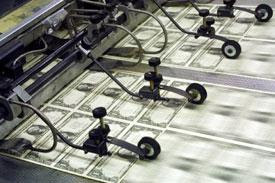 At that point, Williams suggested the Federal Reserve will have to become the U.S. government's lender of last resort, and as the U.S. government monetizes the debt, "we will have no choice but to head down the path of hyperinflation." Williams argues the total U.S. obligations, including Social Security and Medicare benefits to be paid in the future, have effectively placed the U.S. government in bankruptcy. He comes to that conclusion even without taking into consideration any future and continuing social welfare obligations embedded in the Obama administration's planned massive overhaul of health care insurance. Statistics generated in Williams' most recent newsletter demonstrate the real 2009 federal budget deficit was $4.3 trillion, not the $1.417 trillion previously reported by the Congressional Budget Office, according to the 2009 Financial Report of the United States Government as released by the U.S. Department of Treasury Feb. 26. The difference between the $1.417 trillion "official" budget deficit numbers and the $4.3 trillion budget deficit based on data reported in the 2009 Financial Report of the United States Government is that the official budget deficit is calculated on a cash basis in which all tax receipts, including Social Security tax receipts, are used to pay government liabilities as they occur. The calculations in the 2009 Financial Report of the United States Government are calculated on a GAAP basis (Generally Accepted Accounting Practices) that includes year-for-year changes in the net present value of unfunded liabilities in social insurance programs such as Social Security and Medicare. "The government now does not have the ability to raise taxes high enough to eliminate the deficit in a given year," Williams said. "The government cannot raise taxes high enough to bring the budget into balance. You could tax 100 percent of everyone's income and 100 percent of corporate profits, and the U.S. government would still be showing a federal budget deficit on a GAAP accounting basis." Williams also doubts the Obama administration or the Congress have the political will to slash spending dramatically enough to balance the federal budget. He suggested the GAAP accounting position of the U.S. will be even worse in 2010. "On a cash basis, the Obama administration is projecting a 2010 federal budget deficit about $1.5 trillion, but that is based on positive economic growth for 2010," Williams noted. "Tax revenue in 2010 will not live up to government projections, especially as more federal bailouts are likely to be needed to extend unemployment benefits or to keep the states out of bankruptcy."